Last year, there were exactly three catchers who had at least 15 homers and a .390 on-base percentage: Miguel Montero, Buster Posey, & Carlos Ruiz. Let’s look at those three again, but with a different number added: Montero (100%), Posey (100%), Ruiz (4.9%). That’s the ownership percentage for each of the trio in ESPN leagues right now, and the difference is clear. One of these things does not look like the others, and that’s obviously because Ruiz was suspended for the first 25 games of the season after testing positive for a banned stimulant. Ruiz is eligible to return from his suspension on April 28, a week from Sunday, and he’s allowed to play in minor-league rehab games five days prior to the end of his ban. Considering that the current Philadelphia backstop duo of Erik Kratz & Humberto Quintero has a mere nine hits between them, Ruiz is more than likely to settle right into his old job as the everyday catcher. Considering the season he’s coming off of, that makes him valuable, and those in need of catching help should probably grab him a day or two too early rather than wait for him to make his debut. Yet of course, we can’t simply assume that Ruiz, entering his age-34 season, is going to go out and repeat his 2012 breakout. Last year, he set career highs in batting average, runs, homers, and RBI, and now he’s got the cloud of suspension hanging over his head. Ruiz had a breakout season in 2012, adding power to his repertoire for the first time at age 33. He’d been a quality player for the last few years, mostly based on his ability to make a lot of contact and occasionally drive the ball into the gaps. Homers weren’t really his thing. From 2006 to 2011, his career HR/FB rate was 6.3%, and he posted an ISO of .128. Last year, his HR/FB rate was 15.1%, and his ISO was .215. 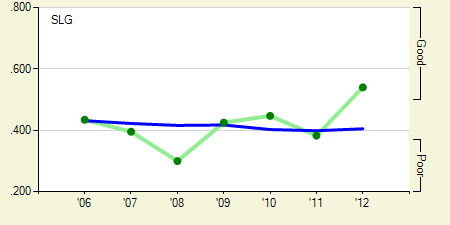 Or, if you prefer pictures, here’s Carlos Ruiz’s slugging percentage, by year, compared to league average. Yeah. It’s not hard to figure out which of these is not like the others. I can’t argue with that, nor can I pretend that anyone should ever expect the 2012 Ruiz again; likely, we’ll never have a good reason to mention him in the same breath as Montero & Posey other than to point out that they’re all National League catchers. Still, I think we’ve come far enough in the shady world of performance enhancers to know that you can’t simply peg things as “juicing = production,” because it’s rarely that simple. As you can see in the chart at right, Ruiz’ success wasn’t entirely a 2012 blip, because he’s been steadily increasing his swing percentage and his line drive percentage for years. Simply put, Ruiz has been swinging at more balls and hitting them well. Even if the fact that more of them went over the wall in 2012 — dig that wild HR/FB — doesn’t sustain, his SLG% in the previous three years was league average or slightly above. For a backstop, that’s not bad, and those in two-catcher leagues or struggling along with someone like Jesus Montero may take notice. Ruiz is never going to repeat last year’s greatness, but he’s a nearly free option who many will have completely forgotten about when he’s available later this month. We hoped you liked reading Don’t Forget: Carlos Ruiz Exists by Mike Petriello! Yahoo’s ownership levels make more sense. ESPN’s leagues are littered with mediocre players and bad data. Yahoo ownership % is at 1%. Nevermind my comment as I have lied. There is 1% who are starting him…which baffles me.